This post originally appeared on UK-based baseball site Bat Flips and Nerds. The podcast referenced here is now also available over at Blog Talk Radio. For more UK-based baseball content, follow @batflips_nerds. It’s the question we’ve all been asking: in a home run derby featuring European baseball players, two international women’s softball stars, three former major leaguers, and two England cricketers, who would win? 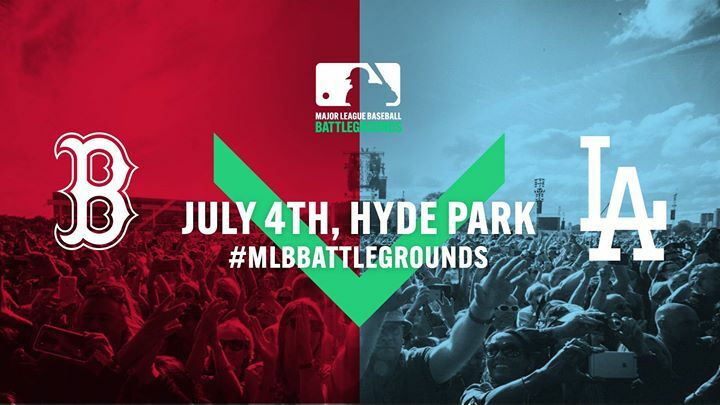 MLB UK finally provided an answer with their MLB Battlegrounds event in Hyde Park yesterday, and John and myself went along to check it out. Batting practice had been advertised for 12:30, which turned out to not only be a chance for the hitters to warm up, but for Colin Murray to practice his extremely enthusiastic introductions and the production team to test out things like the graphics and audio. It emerged that homers in the last 30 seconds were worth two points, and the targets varying amounts, which weren’t explicitly stated: the 150 was definitely three, and the ones attached to the camera towers appeared to be six, although it was hard to tell if that was simply from the double points. Carlos Peña smashed double-digit homers in his warmup run, but former Dodgers minor leaguer Federico Celli was also very impressive, hitting the furthest homer I saw, which landed not too far from where I took that picture. Celli, now playing in Italy again, is still just 22 and looked like he might be able to give the MLB stars a run for their money, despite logging a meagre .092 BA at Single A Great Lakes before being cut by the Dodgers last year. The two cricket stars, Jos Buttler and Alex Hales, weren’t present for this run-through, so it was impossible to gain an insight into how their skills would transfer in advance. Topics of discussion in the bar included how we got into baseball, attending games in the U.S., and Dustin Pedroia‘s ridiculous play in Monday night’s game, which was replayed on the bar’s big screen to John’s delight. At 4, John and I headed up to Hyde Park to pick up our media credentials which would hopefully give us a chance to chat to those taking part in the derby. It’s fair to say that in my rather full-on Giants attire (t-shirt, jersey, cap and even socks), I looked more like someone who had wandered into the media tent by accident. Fortunately no-one threw us out, and we found out we had a slot to talk to Shawn Green. The players eventually came out for some more batting practice in some nets near the stage, so we got a chance to speak to Shawn then. He was as laid-back as you might expect from a player who’s written a book about using Zen to stay focused at the plate. We cheekily hung around and also got to chat to Celli, GB head coach Liam Carroll, MLB’s Managing Director of Europe, Middle East and Africa, Charlie Hill, Telegraph cricket writer Alan Tyers, and the wonderfully exuberant Cliff Floyd. Watch out for the podcast later this week for all of those too. Finally it was time for the main event, with Peña’s Red Sox team (Peña, Buttler, GB international Gary Davison, former Phillies minor leaguer Julsan Kamara, and American softball international Taylor Hoagland) taking on Floyd’s Dodgers (Floyd, Green, Hales, Celli, and Puerto Rican softball star Karla Claudio). While we’d initially thought the fences and what appeared to be fairly restrictive limits on the number of people in many of pens were a bit over the top, once home runs started flying into the crowd and people were scrambling to get a ball, it seemed a lot more sensible. I had wondered whether anyone would try to actually hit the targets, which would clearly be the most effective strategy if anyone could do it regularly, but that didn’t seem to be the case in the early going. Peña put up another double-digit homer performance with 12 in round 1, good for 16 points in total, only to get topped by Celli’s 17, which again included some monster shots. While not as specifically geared to hitting a ton of home runs, the quality of Shawn Green‘s contact was outstanding; it seemed as though everything he hit was in play, with anything that wasn’t a home run still a rocket line drive, one of which almost destroyed a camera tower and – perhaps generously – was counted as a target hit, although it struck well above the target itself. It would have been a home run in any case. Green had told us he hadn’t played in 7 years. It definitely didn’t look like that when he was hitting, although he did look exhausted afterwards, making that seem a lot more plausible. The cricket stars definitely did not look like baseball players. Hales seemed to be generating a lot of his power with his knees and struggled early before finding a rhythm to hit a few out, while Buttler was constantly dropping his front shoulder and couldn’t get a consistent swing going. Both still hit some impressive shots considering their lack of experience, but I think both were also struck by how difficult it was, and how easy the baseball players made it look. Floyd was up last, and he actually did seem to have a target-based strategy, hitting five or six line drives in the vicinity of the 150 target to the right of the stage, and connecting with two of them. We speculated that this might have been the ideal event for the likes of Ichiro Suzuki, who might have been better at deliberately hitting the targets. The inflatable ones did also move a decent amount in the wind, which isn’t an ideal feature if trying to build a strategy around them. Ultimately, Celli and Green were tied for the lead for the Dodgers, but Green let the Italian hit in the final. The 22-year-old defeated Peña by 31 to 26 to win the event for LA. It’s probably not that surprising that a young athlete who still plays professional baseball a couple of times a week would do so well, but I don’t think I was alone in being impressed at how he was able to not only consistently hit them out, but the distance he was getting. On the negative side, the safety of the areas where fans could catch the home runs was questionable. People were understandably eager to acquire a ball, but some of the attempts to do so were rather frantic and people were smashing into barriers and knocking kids out of the way to get to balls. To a certain extent I’m sure most people in those sections knew what was going on after a few bombs and were happy to stay there, and smaller children were kept out of the primary areas around the main fence where the homers were landing, but it’s definitely a concern that should be addressed for future events. The targets also didn’t really come into play all that much and some fans complained that they actually obscured their view of the stage and screens. One other minor quibble that was aired by a number of fans was the relative lack of merchandise for sale. MLB Shop Europe had stalls there selling t-shirts and assorted other gear, but the selection and quality didn’t seem to be all that extensive, and several people were disappointed there wasn’t more. There also weren’t any balls to purchase, much to the annoyance of people who had brought along their gloves but forgotten a ball. It didn’t stop anyone from enjoying their day, but there were certainly plenty of fans there ready to buy lots of gear, so perhaps that’s an area which will be expanded upon in the future. On the plus side, MLB UK were handing out bucketloads of Topps cards, keyrings and mitts and shirts to a few lucky kids whose days were made. Overall it was a terrific day that bodes extremely well for the prospect of future MLB events, including games, which seem increasingly likely to arrive in 2019. With the associated coverage and the number of young fans who got involved with playing on the day, the popularity of the game in the UK is almost certain to have been raised. Let’s see what further developments this brings from MLB’s side – we’ll be there to guide you every step of the way!